It took a bit to get inside the place, as the domestic workers knew nothing of a guest house nor the name of the place we were at, but two young girls arrived who apparently knew of our coming arrival, and helped get us our room and then offered to take us to the game as it was just a 4km drive down the ridge. We thought this was very generous and would allow us to avoid the hassle of the park & rides. This would have consequences though for us post-game. 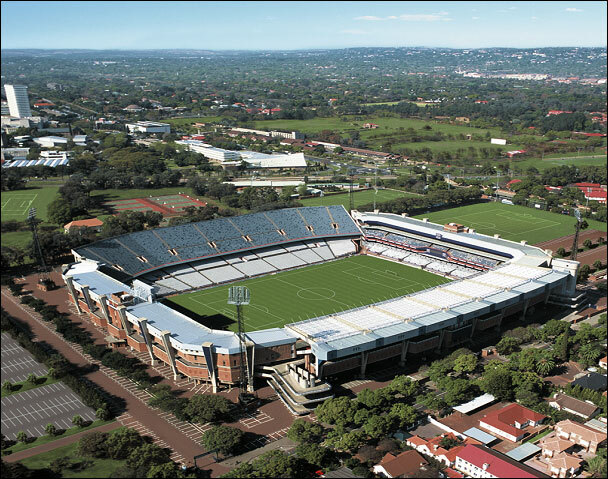 Arriving at the Loftus Versfeld grounds, it looked sparse compared to our other arrivals, but being 2+ hours before kickoff probably made for the subdued atmosphere. Getting through security was hassle free, but they did make Alisa empty her purse for the first time. She was really tempted to try to smuggle in chocolate for this match, so it’s a go thing I told her not to try. What I had thought might be our best tickets of the tournament, sightline wise, turned out to be true, but significantly high up, causing the heights-fearing Alisa to wonder how category 2 tickets can gets us 3 rows back from the corner flag as well as just 7 rows down from the very top of the stadium. However, we were seated on about the 35 yard line, and had great views of the entire field even though it was a bit weird to see the players being so small when we had been spoiled by how close we were from the previous games. Alisa was delighted though that the US would be warming up on our side of the field, but again lamented that it had to happen at the match when our cameras would have to be on full zoom to get any close ups. As we watched the warmups, up walk the exact two guys we sat next to at the Slovenia match. We were both amazed at the likelihood at getting adjoining seats at consecutive US World Cup matches and we swapped emails so that we could exchange pictures when we all return home. Our side of the stadium seemed to have been allocated the majority of Americans and it slowly filled up to be at near capacity. The same could not be said of the category 1 side (also the side of the suites that hosted former President Bill Clinton for the match), nor behind the goals where there were significant blocks of empty seats. Despite FIFA saying they are happy with ticket sales (I believe this game was a sell-out), the fact that the night before at the South Africa-France game there were also large blocks of empty seats, this in the sports mad city of Bloemfontein, for the most important match of the host nation, I have great concerns either for the dedication of South Africans to this tournament, or the ability for travel agencies to sell tickets to one of the most anticipated games of the group stage. The announced attendance for both matches were in the high 30,000s, still 5k-10k short of capacity…. The match began in a back and forth manner, that was quite the opposite of the quotes of US player Clint Dempsey who thought it would be a tight affair until the later stages. An early goal is ruled out for offside against Dempsey who slotted home from close range. Shockingly this replay was shown minutes later on the big screen. The big screens in the stadiums had been carrying the life FIFA stream during the matches, but whenever it would cut to something controversial (even a minor thing), the stadium screens would cut to a birds eye view of the field and the players to in effect ‘black out’ the reply. However, the screens were showing more replays than we had seen before in the early stages and then about 7 minutes after the offside call, the showed a replay that clearly showed Dempsey was ONSIDE at the time the ball was played and that the goal should have stood. Only a small fraction of people saw it (I just happened to be looking to the left and caught sight of it), and a small chorus of boos ran out, though nothing like the vitriol that would have been directed at the match officials had the majority in the stadium seen the replay. I thought that another good goal waved off by the officials would further denigrate the job match officials do in the eyes of the American pubic, and silently hoped that the disallowed goal would not be critical. However, that was not to be the case as chances aplenty came the US’s way, but poor finishing from Dempsey for the rest of the match, and an anonymous performance by Landon Donovan meant none of our chances for the next 80+ minutes were converted. This was far and above the most pro-US crowd we had encountered, a chants of “U-S-A” arose even before kick off and continued throughout the match. Were we audible enough to make ESPN back home?? The crowd was also very European/American in it’s actions with the large block of Algerians whistling the US whenever they maintained possession for long periods of time, and the Americans urging the players forward whenever a quick attack looked eminent. Alisa was at her most involved in a sporting event, nerves-wise, as I have ever seen her. Prayers of “Please God, please” escaped her mouth on a near chance from the US, and she was so impassioned that she was properly blowing on her vuvuzela, and quite loudly too. As the 85th minute loomed she grabbed my hand and tightly squeezed, and while hard, it was nothing like the pressure the Algerian goal was under and the US streamed forward, attack after attack, but poor final balls, or a poor touch when in on goal prevented any Americans from taking their chances and putting us in the next round. At that point, we had knew from a guy sitting just down the row from us that England had scored early in their match and that there was no other goals reported, and this must have been known by the fans in the stadium given their exasperation in pushing the team onwards in the final minutes, as we knew only a goal would send us through to the next round. We were seated in the sun for the first time, and in the second half as the sun set, it seemed to hold its place in the hazy Pretoria sky, seemingly the rest of the world had frozen in time while the most exhilarating soccer match played out beneath us. I kept thinking in the final minutes that I had not planned for three years to come back and witness both Bafana Bafana and the United States crash out at the first time of asking. Thoughts of how I could possibly go to Bloemfontein for the knockout game I had bought tickets to and cheer on another nation after how close my own country had been started to run through my mind, and thoughts back to Germany 2006 on how pitiful the US had performed, and now they had come to South Africa and gotten a lucky point against England, and then were robbed of three points by an African referee against Slovenia, and now with the pressure on, they simply could not find a winner despite Bob Bradley risking it all (when could that ever had been said about Bradley before?) and throwing on Feilhaber, Buddle, and Beasley, all for defensive players in the second half. As the 4 minutes went up on the Fourth Official’s scoreboard it was met with stressed cheers from the American fans, hoping that it would be enough for one last US attack. It was. And finally, a goal. How the build up to the play happened, I do not remember. All I have seared in my mind was a picture of the Algerian keeper sprayed out on the ground having lost the ball, with Landon Donovan closing in, certain to get it first and poking out a toe. I don’t even know if I watched it go into the net. All I know is that myself, Alisa, our two friends from the Slovenia match, and every other American lost their minds in the next few seconds and a enormous roar went up and continued unabated, no referee whistle, no AR flag, and I saw out of the corner of my eye the US bench sprint to the corner to mob Donovan. To say it was one of the defining moments of US Soccer, could be quite apt, as I had thought in the preceding minutes what a goal then would mean, and how it would rank up against the goal scored by a Haitian – American dishwasher in 1950 that defeated England, or the goal scored against Trinidad and Tobago in 1989 to send the US back to the World Cup for the first time in 40 years, two of the most important goals in US history. How Donovan’s goal mouth scramble poke in ranks will have to be decided in the weeks and months to come, but certainly in that stadium for all the spectators, it was the most important goal we had ever seen in our lives. The US has never been known for their dramatics in the World Cup, but the past two games, which one of our friends from the Slovenia match called the two most important games in US Soccer history, have been some of the most dramatic soccer I have ever witnessed and certainly the most drama filled consecutive games for the US National Team in its history. We had to endure another corner kick to Algeria to see out the match, but we were bailed out by a foul called on an Algerian player just as the ball came and looked to be dangerous, resulting in dissent from the Algerian and his second yellow card. At the final whistle bedlam once again broke out in the stands and on the crowd as we could all exhale and celebrate the US finishing top of their World Cup Group C, the first time a US team has ever won their group. Too afraid to speak of it before, but now Alisa and I had to seriously consider how to we change our plans from going to Bloemfontein to Rustenburg where the US was now heading a group winner. Thankfully, I had taken the number of two England fans who we had met after the opening game, who, expecting England to top the group, had bought tickets to the knock out game in Rustenburg and had been gladly willing to swap if somehow the US got first and England finished second (something they had chuckled at…. admittedly something I had chuckled at as well). I actually got a txt from one of them right at the final whistle asking to swap, so we will work that out over the next day, as we must find accommodation, and transportation, as we return our car this Friday. All changes we will gladly make, and as Ghana has been confirmed as our opponent in the late games tonight, it makes Alisa happy as well, since it will allow her to see the country that first introduced her (however subconsciously to the sport of soccer), in World Cup match. Going back to the Royal Bafokeng might mean dealing with their terrible organization, and completely open stadium (which means no heat is captured and being another 2030 kickoff it is bound to be another cold match), but it is all worth seeing the US try to advance to the quarterfinals for the first time since 2002. Post match, I had realized I had left my phone in our host’s car, which had the digits for the girl’s phone that I was to ring when we were ready to be picked up. We went to the pick up point hoping that had seen my phone in the back of their Mercedes, but no luck, so we had to make the hour long trek up the large ridge back to their house. Alisa was none too happy about the walk, but at least we had won the game, and we walked up in silent happiness. We hoped in the car and set off to Bangkok Wok, which Alisa had been craving since we left Durban in 2007. I had the best Chicken fried rice of my life and Alisa ordered her favourite, Red Curry with Noodles. We topped it off with desert at the NewsCafe as we watched Germany defeate Ghana. Which all sets up a dash to make plans to get us back to Rustenburg for Saturday. We’ll write more once we have plans confirmed! This entry was posted in South Africa, World Cup 2010 and tagged Bangkok Wok, Loftus Versfeld, Pretoria, Soccer, USMNT, World Cup by Alex Laverty. Bookmark the permalink.